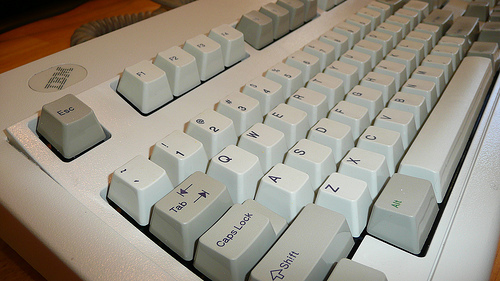 Note: since the IBM Model M does not have a command key I’ve effectively thrown out “caps lock.” But honestly, aside from email screamers, who uses caps lock? I have also downloaded DoubleCommand which offers more powerful key re-mapping. If it is dramatically better, I’ll post a note about it here. This entry was posted in physics and tagged IBM, keyboard, mac, model m, ps/2, usb. Bookmark the permalink. >But honestly, aside from email screamers, who uses caps lock? Those of us who write copy/scripts for broadcasting need caps lock. If you type in all caps, bold, and double spaced, you can easily gauge the length of the recording you’ll get. THANK YOU SO MUCH FOR THE KEY REMAPPING! I tried doublecommand – it failed after Lion upgrade. but your mapping seems to work. Oddly, my CAPS LOCK KEY DOES WORK. I’m using a Tripp-Lite U218-000-R PS/2 to USB adapter to connect my 1987 Model M to my new mac mini. ← The Educational Benefit of Ugly Fonts?